Leaders from left to right, Malaysia's Prime Minister Najib Razak, Myanmar's State Councellor and Foreign Minister Aung San Suu Kyi, Thailand's Prime Minister Prayut Chan-ocha, Vietnam's Prime Minister Nguyen Xuan Phuc, U.S. President Donald Trump, Philippine President Rodrigo Duterte, Singapore's Prime Minister Lee Hsien Loong, Brunei's Sultan Hassanal Bolkiah, Cambodia's Prime Minister Hun Sen, Indonesia's President Joko Widodo and Laos Prime Minister Thongloun Sisoulith, pose for a family photo during the ASEAN-US Summit in Manila on Monday Nov. 13, 2017. The White House has resisted gushing overtures Cambodian Prime Minister Hun Sen made this week to U.S. President Donald Trump in Manila, issuing a stiff rebuke Tuesday to the strongman over his moves to dismantle Cambodia's democracy. Hun Sen lavished praise on Trump the day before, declaring him “a great man to me,” while beseeching the U.S. president to muzzle criticism of his ongoing crackdown on civil society, the press and the opposition. The Cambodian premier extolled Trump’s “non-interference” foreign affairs policy at the ASEAN summit in Manila, in a speech that came as Hun Sen continues to accuse the U.S. embassy of leading a plot to topple his government. He made the same accusation to justify jailing opposition leader Kem Sokha while moving to dissolve Kem Sokha's Cambodia National Rescue Party. In a statement on Tuesday, the White House said Matt Pottinger, the senior director for Asian affairs and Patrick Murphy, deputy assistant secretary of state for Southeast Asia, had met with Cambodian Foreign Minister Prak Sokhonn on the sidelines of the recent East Asia Summit in Manila. “Expressing their interest in supporting the future success of Cambodia, the U.S. side forthrightly expressed strong concerns about recent steps that challenge the country's democratic progress, including restrictions on the free press, civil society, and the political opposition,” the statement said. “U.S. participants noted that unfounded accusations and criticisms of the United States, including U.S. diplomats in Cambodia, contradict the spirit of improved and productive bilateral relations between our two countries,” it added. The statement also noted substantial U.S. foreign assistance in “building a democratic system and achieving progress on prosperity, peace, and reconciliation” but said nothing of Hun Sen’s request for Trump to reconsider Cambodia's $500 million debt to Washington that dates to the Vietnam War. FILE - Cambodia's Prime Minister Hun Sen at the National Assembly of Cambodia, in central Phnom Penh, Oct. 12, 2017. Members of Hun Sen’s delegation declined to speak with VOA reporters in Manila about the statement, and relevant spokesmen in Phnom Penh could not be reached. In a speech at the summit on Monday, Hun Sen said, “I think your excellency [President Trump] is a great person who I respect the most,” according to an unofficial translation of the speech — in which he also boasted that he had predicted Trump’s victory, before turning to domestic matters. On Thursday, Cambodia’s courts are set to decide if the opposition CNRP should be dissolved under draconian legislation for allegedly conspiring to overthrow the government in a plot with the U.S. embassy. 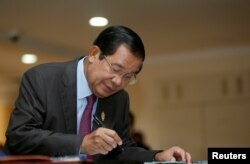 Hun Sen has said it is a certainty Cambodia’s nominally independent Supreme Court will rule against the CNRP. Interior Minister Sar Kheng on Monday ordered provincial and city governors across the country to form working groups that will monitor treasonous activity beginning the day before the CNRP dissolution ruling. Late last month, Defense Minister Tea Banh, who has threatened to smash the teeth of political protesters, told a newly established military intervention force to “take action immediately without asking advice from the top” against any movement demanding the release of Kem Sokha. “I think putting out the statement is just their way of signaling subtle displeasure with that hamfisted attempt by Hun Sen to appeal to Donald Trump’s vanity,” he said. Some U.S. senators and EU parliamentarians have begun pushing for punitive actions against Hun Sen’s government, such as targeted sanctions and travel bans in response to the jailing of Kem Sokha. Others have stressed the elections will not be recognized if the opposition is dissolved. In his speech, Hun Sen also implored Trump to reconsider the terms of some $500 million his government owes the United States. The debt dates to the secret U.S. bombing campaign against North Vietnamese supply routes inside Cambodia in the early 1970s. Estimates vary but the bombings are believed to have killed tens of thousands of Cambodians and destroyed large swaths of farmland. The U.S. loaned the country's government money at the time to pay for food. The U.S. bombings were later considered illegal because they were carried out without the approval of the U.S. Congress.